Filth and piracy walk hand in hand when a ship’s captain avoids all contact with water. The fact that Monty the Malodorous can’t swim is a closely guarded secret, and like anyone living a lie, he’s perfected the art of faking it. As he puts it, “Real pirates don’t bathe! Yar-har-har!” Things grow complicated, however, when Monty falls in love with a mermaid named Meg. Though she’s happy to be his friend, a dinner date is swiftly rejected: “You’re a real nice pirate, Monty, but you smell like stinky boots.” The pirate is distraught, but far worse is in store when a giant octopus nabs Meg and aquaphobic Monty is the sole witness. Can love overcome fear? While this may sound like a standard tale of a maiden in distress, the story makes sure to require that Monty be rescued as frequently as his fishy love. 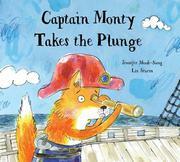 Monty is portrayed in gentle watercolors as a fox alongside an all-animal crew that’s also notable for its independence from disability stereotypes. Meg, in contrast, is dark-skinned, distinctly zaftig, armpit-haired, and frequently seen with a book in her hands. This odd-couple tale has a sweetness that makes it more than its standard face-your-fears message.